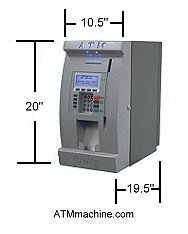 The WRG Apollo ATM gives you full-size ATM capabilities in a conveniently smaller model! We understand utilizing space is essential in your business - and the Apollo can make the most of it! With optional features like the through-the-wall kit, pedestal, and the counter-top, the Apollo maximizes your space and profitability.